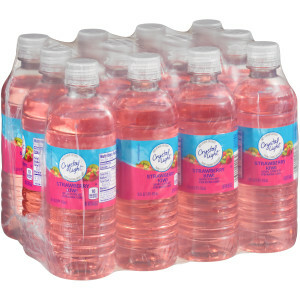 CRYSTAL LIGHT provides a refreshing alternative to sodas and makes any glass or bottle of water more exciting, without a high calorie count. Refresh with the taste of Cherry for a classic CRYSTAL LIGHT flavor. 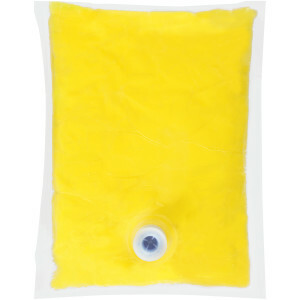 Mix the liquid concentrate to make 1 gallon of product. 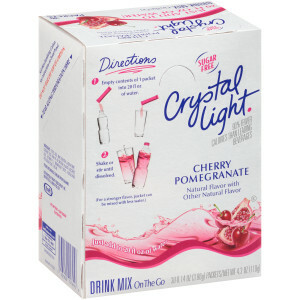 CRYSTAL LIGHT provides a refreshing alternative to sodas and makes any glass or bottle of water more exciting, without a high calorie count. Refresh with the taste of Lemon Iced Tea for a classic CRYSTAL LIGHT flavor. Mix the liquid concentrate to make 1 gallon of product. 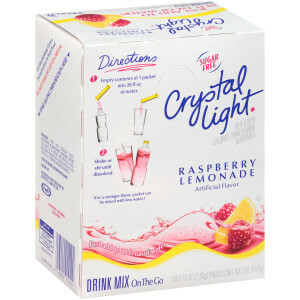 CRYSTAL LIGHT provides a refreshing alternative to sodas and makes any glass or bottle of water more exciting, without a high calorie count. 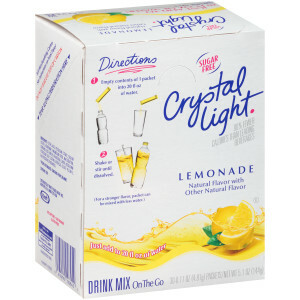 Refresh with the taste of Lemonade for a classic CRYSTAL LIGHT flavor. Mix the liquid concentrate to make 1 gallon of product. 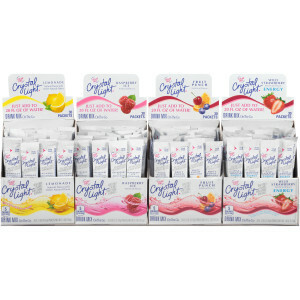 Crystal Light Liquid Concentrate - Raspberry, 32 oz. 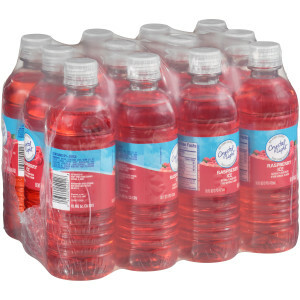 CRYSTAL LIGHT provides a refreshing alternative to sodas and makes any glass or bottle of water more exciting, without a high calorie count. Refresh with the taste of Raspberry Ice for a classic CRYSTAL LIGHT flavor. 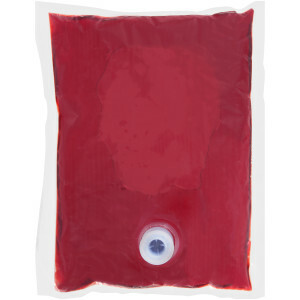 Mix the liquid concentrate to make 1 gallon of product. CRYSTAL LIGHT provides a refreshing alternative to sodas and makes any glass or bottle of water more exciting, without a high calorie count. Refresh with the taste of Cherry Pomegranate for a classic CRYSTAL LIGHT flavor. Mix in a 20 ounce bottle; just add convenient packets' powder to water. 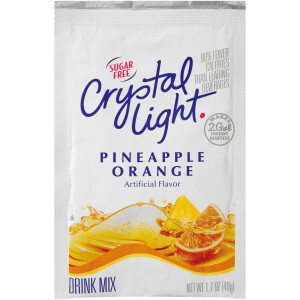 CRYSTAL LIGHT provides a refreshing alternative to sodas and makes any glass or bottle of water more exciting, without a high calorie count. Refresh with the taste of Fruit Punch for a classic CRYSTAL LIGHT flavor. Mix in a 20 ounce bottle; just add convenient packets' powder to water. 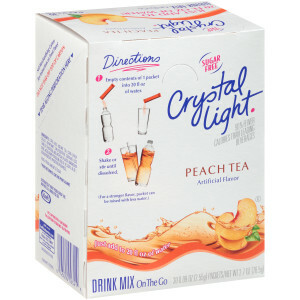 CRYSTAL LIGHT provides a refreshing alternative to sodas and makes any glass or bottle of water more exciting, without a high calorie count. 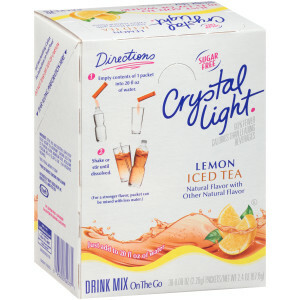 Refresh with the taste of Iced Tea for a classic CRYSTAL LIGHT flavor. Mix in a 20 ounce bottle; just add convenient packets' powder to water. CRYSTAL LIGHT provides a refreshing alternative to sodas and makes any glass or bottle of water more exciting, without a high calorie count. 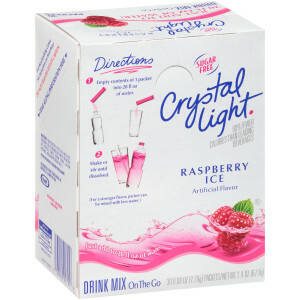 Refresh with the taste of Raspberry Ice for a classic CRYSTAL LIGHT flavor. Mix in a 20 ounce bottle; just add convenient packets' powder to water. CRYSTAL LIGHT provides a refreshing alternative to sodas and makes any glass or bottle of water more exciting, without a high calorie count. 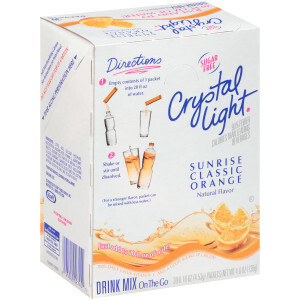 Refresh with the taste of Sunrise Orange for a classic CRYSTAL LIGHT flavor. Mix in a 20 ounce bottle; just add convenient packets' powder to water. 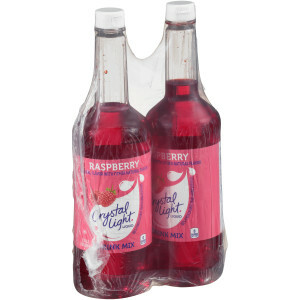 CRYSTAL LIGHT provides a refreshing alternative to sodas and makes any glass or bottle of water more exciting, without a high calorie count. 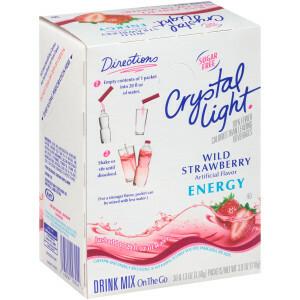 Refresh with the taste of Wild Strawberry with Energy for a classic CRYSTAL LIGHT flavor. Mix in a 20 ounce bottle; just add convenient packets' powder to water. 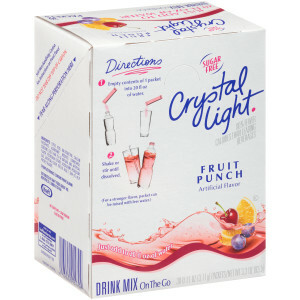 CRYSTAL LIGHT provides a refreshing alternative to sodas and makes any glass or bottle of water more exciting, without a high calorie count. Refresh with the taste of Strawberry Kiwi for a classic CRYSTAL LIGHT flavor. Mix by the bottle or pitcher; just add convenient packets' powder to water to make 2 gallons. CRYSTAL LIGHT provides a refreshing alternative to sodas and makes any glass or bottle of water more exciting, without a high calorie count. 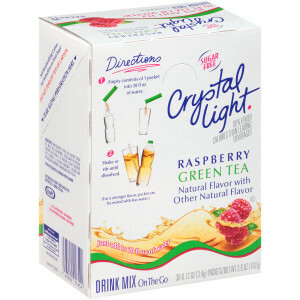 Refresh with a variety of flavors for a classic CRYSTAL LIGHT tastes. Mix in a 20 ounce bottle; just add convenient packets' powder to water. Refresh yourself any time with Crystal Light: low and no-calorie drink flavors with the classic Crystal Light deliciousness you love. Mix by the bottle or pitcher; just add convenient packets or drink powder to water. 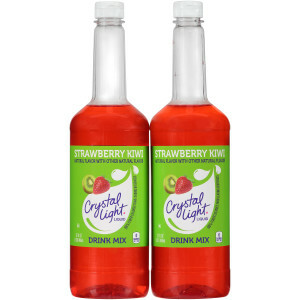 CRYSTAL LIGHT provides a refreshing alternative to sodas and makes any glass or bottle of water more exciting, without a high calorie count. Refresh with the taste of Wild Strawberry for a classic CRYSTAL LIGHT flavor. 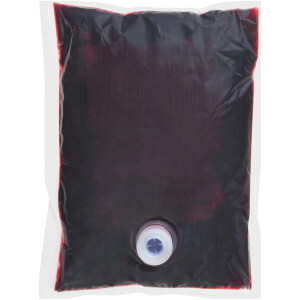 Mix the liquid concentrate to make 1 gallon of product.